Some 83 outpatients who were due to have a MRI scan were split into two groups. Both groups received the standard MRI Centre information leaflet which included safety information, information related to the appointment, technical features of an MRI scanner, data protection and the experience that might be expected. Only one of these groups received the study DVD. The DVD contained two sections. 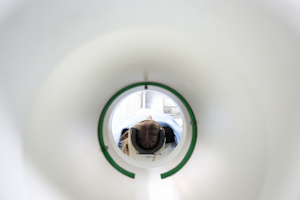 The first was ‘Preparation for MRI’ and included information about the procedures to expect, information about what the scan experience would feel like, a demonstration of a patient undergoing a scan, and information about others’ experiences of having an MRI scan. The second section detailed relaxation techniques and encouraged patients to practice the techniques before and during their scan. They were asked to watch the DVD at least once before their scan appointment. Of the 41 patients who received the DVD, 35 had satisfactory scan outcomes. In contrast, in the other group with 42 patients, only 23 had satisfactory scans. A ‘satisfactory’ scan was one where patients successfully stayed in the scanner for the full examination and had high quality images (i.e. patient movement had not reduced image quality). Dr Powell explained: “We found that the vast majority of participants found the DVD an easy format to use, with almost all participants viewing the DVD at least once, with over half the participants using it at least twice. Most of the participants found the DVD useful and said it helped them to feel less anxious and more confident about taking the scan. This work was funded by the Ministry of Higher Education, Malaysia and was conducted as part of Mahadir Ahmad’s PhD at the University of Aberdeen.